I’m not sure what to tell you about this book. We Need to Talk About Kevin is definitely a good book, but I’m hesitent to recommend it. The pros: It’s engaging, original, and extremely well-written. The story is essentially about the relationship between mothers and children and husbands and wives, but it’s such a different angle that it seems new and fresh. The writing style is phenomenal - very real and very impressive. The cons: It’s disturbing, at times horrifying, depressing, and gave me nightmares. Considering those points, I can’t recommend this book. But I wouldn’t un-recommend it either…I just suggest you know what you’re getting into. 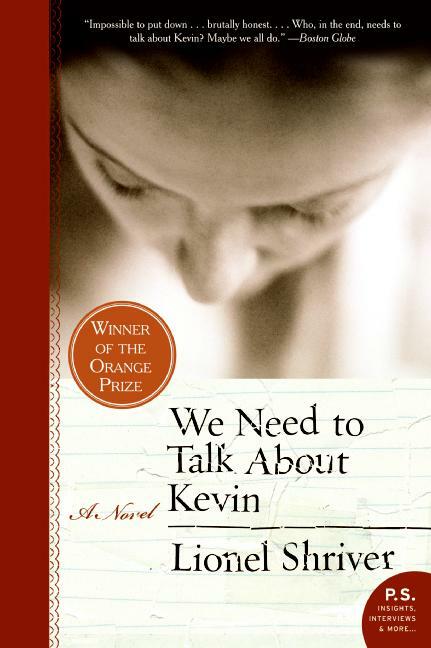 Basically, if you want to read something that will convince you NOT to get married or reproduce, We Need to Talk About Kevin is your book. "I may be hounded by that why question, but I wonder how hard I've really tried to answer it. I'm not sure that I want to understand Kevin, to find a well within myself so inky that from its depths what he did makes sense. Yet little by little, led kicking and screaming, I grasp the rationality of Thursday." I found myself sympathysizing with Eva (the mother). The way I read it, she had an abusive husband and a devil-child and though she was certainly not perfect, I felt she was more the victim than the criminal. BUT apparently a lot of other people read it differently! They felt for Kevin, and blamed the mother for the way her son turned out. I guess it’s that question of nature vs. nurture. It wasn’t gratuitously violent…what disturbed me was the cruelty of it. I guess that speaks to the skill of the author – she could make her characters feel so real that I believed them and all their actions. But sometimes I had to put it down because it got to be too much. It's going to become a movie in 2011! Go here for details. Go here for a review. Go here to learn more about Lionel Shriver.